Native to tropical South America, bougainvillea grows around the world as an ornamental climber and shrub. It is one of the most commonly grown plants in subtropical and tropical gardens and is a Mediterranean favorite. Bougainvilleas are easy to grow in frost-free conditions and there are hundreds of cultivars with different colored flowers. Bougainvillea flowers are white and tubular and only 1 inch long. The famous colorful petals of the flowers are in fact modified leaves or bracts. Each flower is surrounded by three paper-like bracts, giving the plant its alternative name of paper flower. The bracts can be purple, red, yellow, orange or pink and some modern cultivars have double bract structures and mixed colors. The flowers and bracts are long-lasting and grow on the end of new branches. Bougainvillea rarely sets seed in cultivation. The leaves of bougainvillea plants grow alternately on the stems and are oval or heart shaped with a pointed tip. They are up to 4 inches long and 2 inches across. Bougainvilleas are evergreen but sometimes shed large numbers of leaves in the late summer or during dry spells. Some modern varieties have variegated leaves. Bougainvillea is by nature a vigorous and chaotic plant that produces long, trailing stems covered in sharp spines. It can be grown as a climber or pruned into a free-standing shrub up to 10 feet tall. Bougainvilleas can also be shaped into a hedge and benefit from heavy pruning, as the flowers come on new growth. The stems do not produce tendrils but are still capable of climbing up walls or tree trunks. Large plants can be 40 feet long and cover entire pergolas. The three species in cultivation seem to hybridize freely, producing large numbers of different varieties. The largest and most rampant species is Bougainvillea spectabilis which can be recognized by the hairy undersides of its leaves. B. glabra is smaller and produces flower all along its stems rather than just at the ends. It also has fewer spines that B. spectabilis. B peruviana has small, crinkly bracts and green stems, even when large. 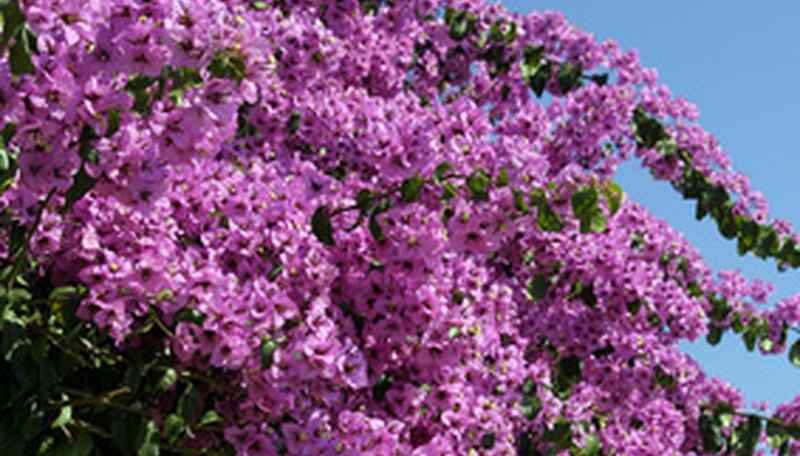 Bougainvilleas are frost tender and require sunny conditions and well-drained soil. They should be watered frequently in the summer as soon as the leaves start to wilt but have sensitive roots and will suffer if waterlogged. They also make excellent container plants and can be grown indoors on a sunny windowsill or trained as a bonsai. A high phosphate fertilizer encourages flowering.